As organizations strive to do more with less, DB2 Enterprise Server Edition V9 for Linux, Unix, and Windows contains innovative features for delivering information on demand and scaling databases to new levels. 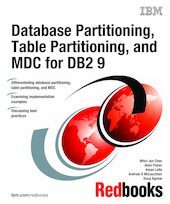 The table partitioning, newly introduced in DB2 9, and the database partitioning feature provide scalability, performance, and flexibility for data store. The multi-dimension clustering table enables rows with similar values across multiple dimensions to be physically clustered together on disk. This clustering allows for efficient I/O and provides performance gain for typical analytical queries. How are these features and functions different? How do you decide which technique is best for your database needs? Can you use more than one technique concurrently? This IBM Redbooks publication addresses these questions and more. Learn how to set up and administer database partitioning. Explore the table partitioning function and how you can easily add and remove years of data on your warehouse. Analyze your data to discern how multi-dimensional clustering can drastically improve your query performance.